Do you experience challenges with the process of window cleaning around your house? Your struggles are not enough to cleanse stains, water streaks and grime from glass surfaces? The professionals of window cleaning in South Quay will help you out! Say goodbye to the innumerable hours of polishing and wiping – the skilled and experienced team will manage this burden. You will be able to enjoy your free time – just let us do this time-consuming and tiresome chore for you. Our professional approach will grant you lots of perks. We also provide our professional services in nearby areas: Westferry, Mudchute, London Arena, East India, West India Quay. We promise that the windows of your business premise will be nice and gleaming, like brand-new. Achieve that by just booking our commercial window cleaning. For glass surfaces up to the fourth floor, we use water fed extension pole equipment which is completely safe and efficient. London is famous for it's tall buildings. So when it comes to those high-rised windows we will bring our rope access team. With this efficient method, we can give you results like no other! We provide private and business window cleaning by using efficient techniques. You can rely on our professionalism for all types of glass surfaces, roof windows and conservatories. For windows placed up to your fourth floor, we use water-fed extension poles. This system is convenient and allows safe cleaning procedures – the poles are attached to the water tank in the van. For high-rise window surfaces, our rope access option will grant you fast and effective end results. You can gain a lot from these techniques right now – just dial 020 3746 3113 and book a visit! You can count on the team - they are the true specialists of window cleaning. They all have passed through diverse training, so you can receive second-to-none assistance for all glass surfaces kinds. What we can wash includes: single, double, garden windows, bay or sash windows, patio doors, French doors, greenhouses and skylights. Your house can be improved quickly with our help. Call us every time you need efficient window cleaning for your house or business. 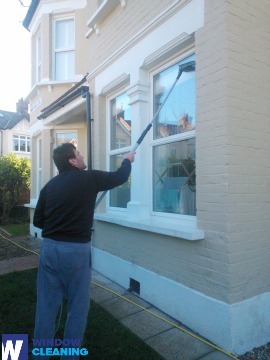 Profit from our residential window cleaning in South Quay – we provide great services for your home on low prices. We use purified water to clean the windows inside and out. We stay safely on the ground and clean with water-fed pole system. Contact us now - dial 020 3746 3113 or just use our booking form. Our operators will help you book and answer all of your questions. You will appreciate the end-results of our household services, we promise that!